In stock! Order now & it ships immediately! Included Polycarb0nate body and ABS body Set. 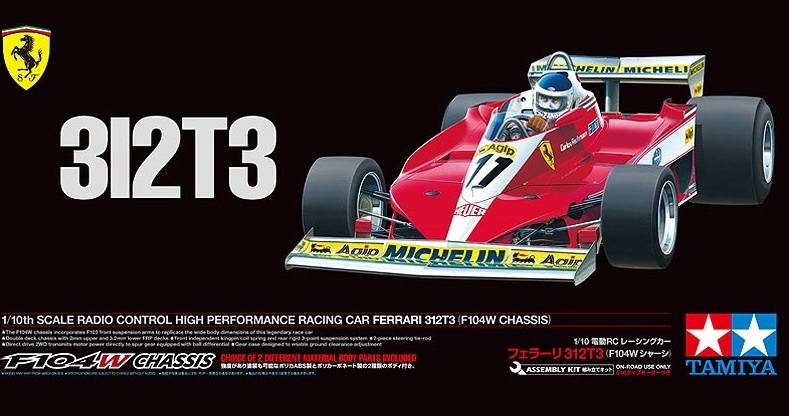 Tamiya is delighted to announce the return of the 312T3, last offered as Item 49191 back in 2001. It is paired with the F104W chassis for the first time. The 312T3 made its debut in the 1978 South African Grand Prix. Underneath its aerodynamically polished body lay a 3-liter 12-cylinder 510hp engine. Drivers C.Reutemann and G.Villeneuve took the 312T3 to 4 victories for the season and the runner-up spot in the 1978 Constructors Championship.  This is a 1/10 scale R/C model assembly kit. Length: 447mm, width: 201mm.  A detailed polycarbonate-ABS body captures the 312T3 form with aplomb. It features a bumper to go under the front wing, and a helmeted driver figure. Wings and wheels are metal plated.  As a bonus, a separate standard polycarbonate body is also included in the kit. 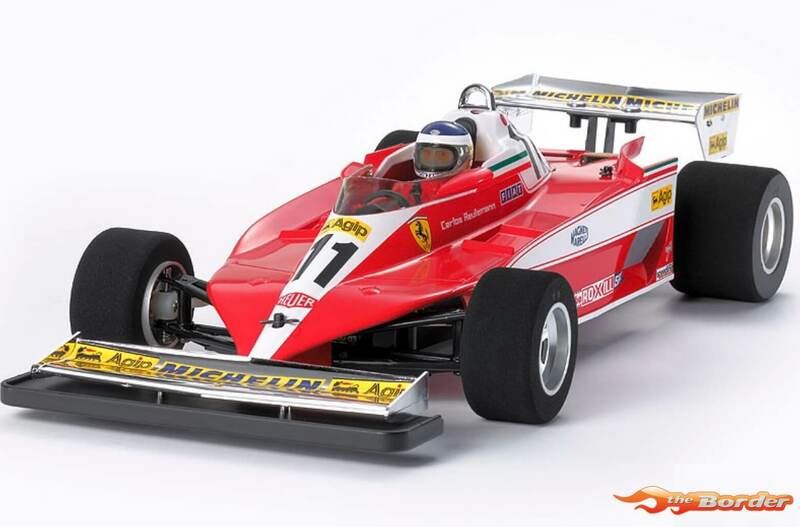  The F104W chassis has F103 front suspension arms to replicate the wide form of the 312T3. It utilizes an FRP semi-double deck (upper: 2mm, lower: 3.2mm) and longitudinal battery position.  Highly efficient direct drive 2WD features the motor pinion directly connected to the spur gear which has a built-in ball differential. Gear case allows 5 different ground clearances.  Kingpin coil spring front and T-bar rear suspension setups provide a smooth, precise drive.  2 cars' worth of markings are in the kit (Nos.11 and 12 included).  A wide range of Hop-Up Options is available to tune the chassis.